“Don’t Be Sorry” said the government to the people… | Les Vaches font 'Meuh'! Don’t stand idle beside injustice. As my usual habits concern, my trailing on Facebook led me to an interesting advertisement from the Australian government on Asylum seekers arriving by boat. They call the campaign ‘Don’t be sorry’. Well, I was ‘sorry’ to see this site. What prompted me to write this blog is due to a vast majority of our population who blindly accept information fed to us through the government. Living in a democracy does not make us exempt from government propaganda, they remain biased for the reason of political campaigns or for popular opinion. The government and the coalition are wonderful, aren’t they? The issue concerning Asylum seekers must be one of the greatest injustices of our day. Misinformation is fed through the media (courtesy of the government) on a constant basis, not to mention the exuberant expense that it costs the government to run these detention centres. I am not so ignorant to say that we should open our borders to let in all, as this just wouldn’t be viable on so many levels. However, I am greatly concerned of the humanitarian issue which is overlooked by so many Australians, and the uneducated opinions of so many on this topic. 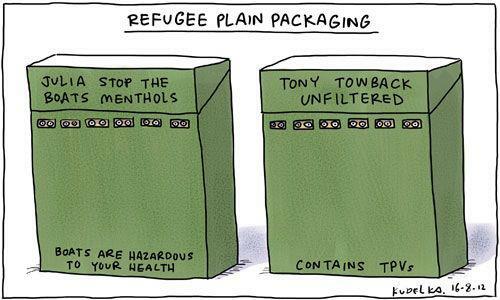 Think of what it takes to become a refugee or an Asylum seeker. What drives people to flee their country? Why would you leave your home, your life, your world, and maybe even your family to come to Australia? Quite obviously, you wouldn’t if you had the choice not too. 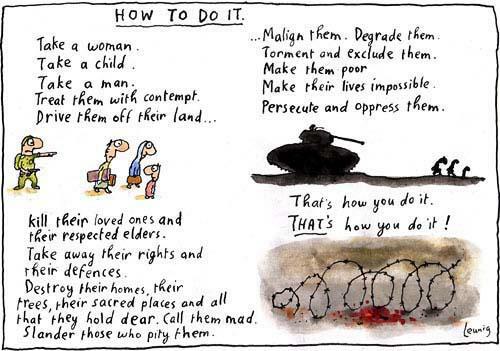 Leunig on how to create an Asylum seeker. Foremost, it is not illegal to claim asylum, thanks Abbot for your ridiculous misinformation! It is written under Article 31 of the 1951 Refugee Convention, which Australia signed, that Asylum seekers who enter Australia without a valid visa by boat or plane are in fact legal, and able to claim asylum in Australia. After the detaining of Asylum seekers, an average of 90% per year are found to have proper asylum claims. The detainment of asylum seekers does have a primary purpose, as it is not designed to detain Asylum seekers as punishment, but to detain them for identity and security reasons, and to provide health checks whilst their status is resolved. Moreover, the worrying issue is the inhumane conditions in which a person is detained. Refugees are persons fleeing persecution, usually brought on by their own government. It can be hard for many of them to gain access to visas as it could be too dangerous to approach an Australian Embassy, or they may have to flee with little notice and have little time to access important documentation. Many people I have met have fled their homes or new country on several occasions, and may have lived in risky situations brought on by wars and government tension for years. Also think about the location of many refugee camps organised by the UNHCR. This formidable organisation is only able to set up camps away from danger; therefore refugees will walk for days to try to access these rural camps. Many people die along the way, and even on arrival at a camp, there may be limited resources such as water. Depending on the war status of your country of origin, you may be there for years on end before refugee visas can be arranged. It is important to emphasise that regardless of the context of the refugee’s persecution, they are always risking their lives in a desperate attempt to find safety or a better life. 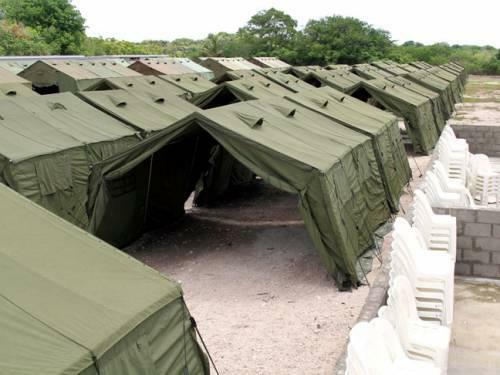 On top of the poor prospects of being a refugee or Asylum seeker, when arriving in Australia as an Asylum seeker on boat, you are welcomed with the troubling conditions of offshore/onshore processing. Placing people in horrible conditions on arrival to Australia does not deter people fleeing prosecution. Firstly, many have no prior knowledge of the conditions of detention centres in Australia, and, I can assure you, you would only leave everything behind you if it was the last choice you had. There is no doubt that long-term detention creates psychological damage for many Asylum seekers, and places them under much physical and mental anguish. Which can be aligned to the affects of punishment. As recent as last week, at the MITA Detention Centre, a 17 year old boy jumped off the roof to try to kill himself, and a man tried to hang himself. There was also the record of the 7th death since 2010 at the Villawood Detention Centre. I think we can all agree that no human should be driven to end their lives. Not to mention the recent hunger strikes as protest. I must also stress that the 2010-2014 budget allocated 1 billion dollars to the detention of Asylum seekers, bearing huge costs on Australian tax payers. Wouldn’t you like to see your money better allocated in a better system for discriminated people? The thing is, the majority of these people become Australian citizens. There seems no reason to spend so much money creating physiological harm or stress for fruitless reasons. So wasteful. The average time for detention is 83 days, but there have been more than 500 people that have been in detention for over two years. Here’s what is wrong with our current detention system. It defies the simple rights of international law that people should be protected under human rights. If fundamental human rights are put at risk, then humane alternatives should be in place in a Western country to protect one’s liberty, safety and health. The Australian Government should not condone those who have done nothing wrong, and the government should fulfil its legal obligations in a humanitarian way, just as it is signatory to convention. So ‘don’t be sorry’ that you haven’t read the facts, and haven’t endeavoured to construct an educated view on such an issue of injustice. How many times will Australia say ‘sorry’ about the wrongs of the past, but not act on humanitarian problems of the present? It is not a question of mentality or how a country was, we can have a voice now on issues that really matter. Well written and well said! there’s a lot to talk about on this issue…. do you think it’s a lack of information or a lack of accessibility? perhaps there’s an unconscious wall put up in people’s minds who don’t want to grapple with the issue because it can be quite confronting… In a way immigrants/asylum seekers/internally displaced persons are, and will continue to be, and incredibly complex problem (in all respects). Glad people such as yourself are discussing it and subverting the effects of this myopic government. Nice. I can always appreciate an article that draws attention to refugees and the current situations they face in ‘Western’ countries.. having lived in Australia and followed the government’s changing decisions regarding their refugee and asylum policies, this is a great subject to discuss. Thanks for bringing it to your blog!